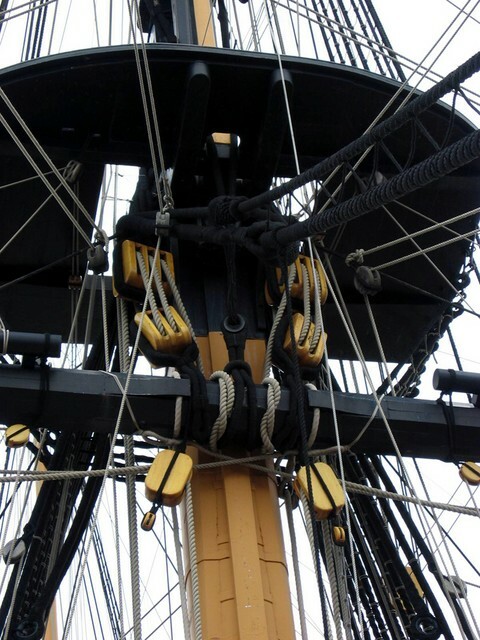 HMS Victory carries four masts - the bowsprit, the fore mast, the main mast and the mizzen mast (bow to stern). The masts carry the horizontal yards from which were slung the great canvas sails - in all a total of some 4 acres of canvas (approximately 16,000m²). 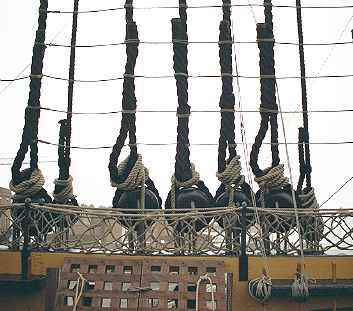 To provide the maximum forward thrust, the position of the sails could be controlled by hauling on the complex system of running rigging. Seamen had to learn which ropes to pull very quickly - or face the wrath of a boatswain's mate with his rope end starter. Setting and furling the sails required the seamen to climb the masts and then to move out along the yard arms, high above the deck and often right out over the sea. The main mast reaches up to a tip at 220 feet above sea level - and in a rough sea the mast would be swinging around wildly. From here a fall was invariably fatal - either the man plunged to the deck and broke his back, neck or legs or he fell overboard. If he went overboard there was little likelihood of the ship being able to put about and stop or to lower a boat. In any case, most men could not swim so by the time a boat was launched and found them they would already have drowned. When 'hands aloft' was called, the duty seamen swung out over the bulwarks and onto the main shrouds (standing rigging), climbing using the thin 'ratlines' as steps. 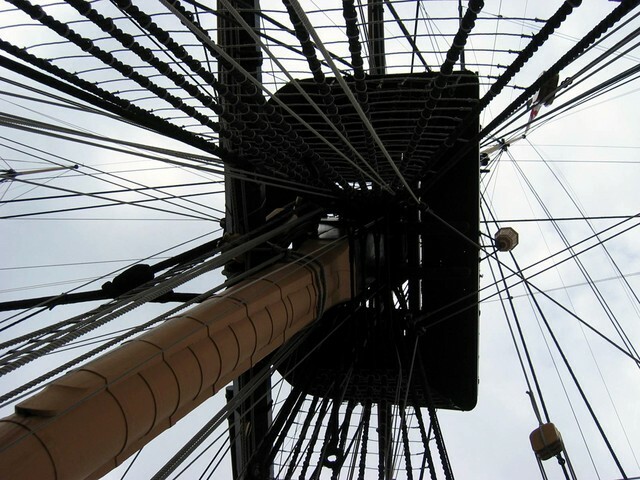 When they reached the fighting top, the experienced seamen would swing out around the top whilst the inexperienced took the safer passage through the lubber hole inside. When they reached the yard, the men would spread out along the yard using the foot ropes for support. Some experienced seamen even ran along the tops of the yards, dropping onto the foot ropes when they reached their station! In position, the seamen held on to the yard arm with one hand and hauled on the sail with the other. This was known as one hand for the ship, one for yourself. content copyright © 2004 - 2018, Gerhard Lentschik. Nachdruck und Weiterverbreitung, auch auszugsweise, nur mit Genehmigung.